I recently had a weekend away on the beautiful shores of the Atlantic Coast in Kerry. 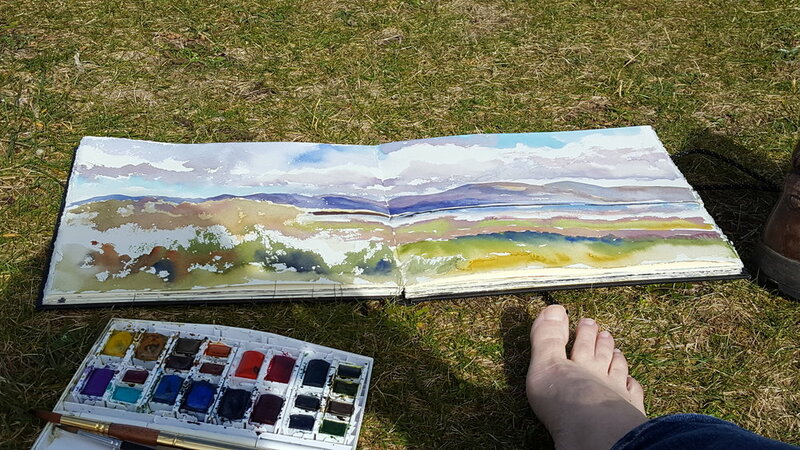 I'd brought my box of paints and had a couple of days of painting out of doors. I can't tell you how alive this makes me feel! I get the double benefit of breathing fresh air and absorbing all those negative ions while being immersed in my favourite occupation. The first time this year my feet have been out of boots! When I got back home I filmed a few demonstration paintings of some easy watercolour techniques. Starting with the sky in part one. You can see it below. While Painting the sea, I use the brush on its side so that I get a broken line as opposed to a block of colour or pigment. It gives me soft edges which work beautifully to describe the movement of the sea, its waves and white horses. This technique is called "Dry Brush". In this last part you'll see that I am adding to the layers with more translucent washes. This is all done on the DRY painting. In this way the layers build to make nice tones within the painting and this gives subtle details. Notice that I haven't tried to draw the waves, or the sand dunes. This is important to represent distance and atmosphere. The final detail, with blades of grass, is reserved for the foreground. The individual brush strokes stand out boldly and contrast with the scene, making it appear 3 dimensional.